What if I accidentally break a CFL, fluorescent bulb or mercury thermometer in my home? If you break a CFL or other fluorescent bulb, follow the instructions below to keep your family, home and environment safe from toxic mercury. If you break a thermometer you think may contain mercury, call immediately to report the spill. 1-800-452-4664. Do not use a vacuum cleaner to clean up the breakage. This can spread mercury vapor and dust throughout the area and may contaminate the vacuum. Keep people and pets away from the area until cleanup is complete. Open windows to ventilate and leave the area for 15 minutes before beginning the cleanup. Mercury vapor levels will be lower by then. Turn off heating or air conditioning to room. Damp paper towels or wet wipes. Wear dishwashing or disposable gloves while cleaning up the broken mercury lamp. Carefully place the larger broken pieces in your container. What if my broken lamp pieces do not fit in my container? Next, begin collecting the smaller pieces and dust. You can use two stiff pieces of paper such as index cards or playing cards to scoop up pieces. Pat the area with the sticky side your tape to pick up fine particles. Wipe the area with a wet wipe or damp paper towel to pick up even smaller bits. Put all waste and materials used to clean up into the container including paper, tape, wet wipes, paper towels and gloves. Label the container as “broken lamp – contains mercury”. Remove the container with the breakage and cleanup materials from your living space. This is particularly important if you did not use a glass container. A cool garage or storage shed is the best place to protect the container until you can take it to your local solid waste facility. As soon as possible, take the container with the waste material to a facility that accepts “universal waste” for recycling. Find a universal waste facility near you: municipal collection sites (pdf format) or call your municipal office. When a break happens on carpeting, homeowners may consider removing throw rugs or the area of carpet where the breakage occurred as a precaution, particularly if the rug is in an area frequented by infants, small children or pregnant women. If the carpet is not removed, open the window to the room during the next several times you vacuum the area to provide good ventilation. The next time you replace a lamp, consider putting a drop cloth on the floor so that any accidental breakage can be easily cleaned up. You may consider not using CFLs in areas where they could be easily broken or in bedrooms or in carpeted areas frequented by infants, small children, or pregnant women. Also when you change a bulb, remember to recycle used and spent lamps as soon as possible instead of storing them to decrease your chances of breakage. What if my broken lamp does not fit in my container? 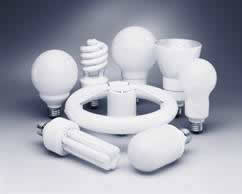 Larger bulbs (e.g., circline and linear fluorescent bulbs): Do not break the bulb more to fit it into a smaller container. If the broken pieces do not fit in your container, double-bag the debris in larger plastic bags and seal both bags to prevent the pieces from spilling and remove it from your home immediately. Place the sealed bags in a cardboard box for transportation. Mercury vapor moves rapidly through plastic bags and cardboard so this choice of container will not contain the mercury vapor. Transportation: If you used plastic bags and a cardboard box to contain your broken lamp, you may as an extra precaution consider driving with your windows down and without children or pregnant women in the vehicle or place the box in the bed of a truck for the drive to the universal waste facility. If you have broken a mercury thermometer, call 1-800-452-4664 immediately. They can help you with cleanup instructions. Cleaning up a broken thermometer is similar to cleaning up a broken CFL. Because a thermometer contains more mercury, you may need to add steps to clean up all the mercury. A flashlight to check for missed mercury after cleaning the area with a wet wipe. Remove your gloves and place them in your disposal container so you do not contaminate your flashlight. Then darken the room and shine a flashlight across the breakage area. Drops of mercury will shine in the light. If you see mercury, put on a new pair of gloves and repeat the cleanup process. Label your container "broken mercury thermometer". For more information contact Stacy Ladner at (207) 287-7853. For more information about Product Stewardship contact Carole Cifrino at (207) 485-8160.